Aya Iwasaki was born in Hillsboro, Oregon in 1927. As a girl, Iwasaki and her six siblings attended a Japanese-language school every Sunday, and spent most of their remaining free time helping to grow and harvest vegetables and berries on the family farm. 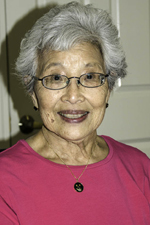 In May 1942, Iwasaki and her family were forcibly relocated from their home to the Portland Livestock Exposition Center, where they were interned along with every other family of Japanese descent in the region. At the time, two of Iwasaki's brothers were supporting the war effort as soldiers in the U.S. Army, but the rest of the family was compelled to stay at the center for three weeks. At that point, Iwasaki and her family were offered the option of working as field workers under the auspices of the Eastern Oregon Farm Labor Bureau. The family was subsequently transported to Nyssa, Oregon, where they lived in four large tents. In September, as the weather became colder, the family moved to the nearby community of Adrian and established residence in the barracks of a former Civilian Conservation Corps camp. Iwasaki and her sisters started school in Nyssa later that month, and the entire family lived under these circumstances for the next three years. 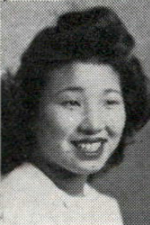 Iwasaki graduated from Nyssa High School in spring 1945 and, following the end of the war that August, she enrolled at Oregon State College in the fall. During her sophomore year, Iwasaki declared a major in Home Economics with a concentration in foods and nutrition. A resident of the Waldo Hall women's dormitory for her first three years at OSC, Iwasaki moved into the newly constructed Sackett Hall during her senior year. She completed her Oregon State degree during the summer of 1950. Following her graduation, Aya married Ed Fujii, a Japanese American farmer whom she had met while both were interned in Adrian. Following their marriage, Aya worked on her husband's berry farm for a year and a half before finding employment as a dietician at Providence Hospital in Portland. She remained at Providence for five years before leaving the hospital to raise her three children. In 1966, Fujii returned to the medical field, once again as a dietician, but this time working at the newly opened Woodland Park Hospital. During her twenty-six year career at Woodland Park, Fujii assisted in particular with Japanese-speaking patients who required consultation regarding dietary restrictions and food choices. She retired in 1992.